Football’s oldest and most prestigious club competition exploded back with a bang last weekend with the advent of the First Round. Following an action-packed preliminary process the eagerly anticipated first stage rocketed off to a stunning start on Friday when non-league minnows Warrington Town shocked an in-form League Two side in Exeter, who had only lost one of their last 10 league games. The upsets, drama and goals continued throughout the weekend, before Preston rounded proceedings off with a routine win over Havant & Waterlooville on the Monday. Below we flick through all the major talking points, as well as previewing what promises to be an enthralling Second Round. 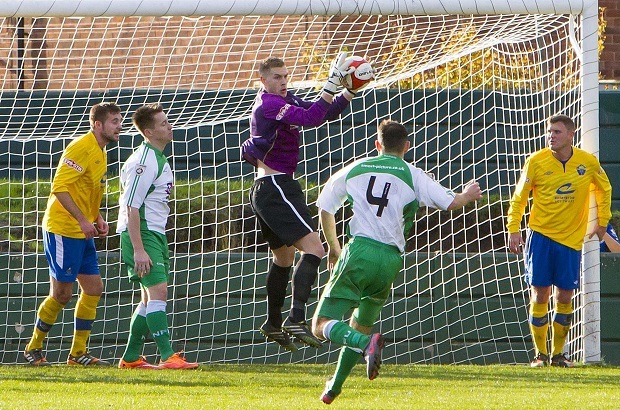 The Magic of the FA Cup lived up to its name as the First Round sprung up some notable upsets. On Friday Northern Premier side Warrington kicked-off the splattering of shocks courtesy of Craig Robinson, brother of MK Dons boss Karl, who gave the underdogs a miraculous 1-0 victory over the Grecians in their first ever appearance at this stage in the club’s 65-year history. The against-the-odds triumph is what the competition is all about, and now the part-timers will be gunning for further success in December. Fellow seventh-tier side Blyth Spartans thrashed Conference club Altrincham 4-1, with Robbie Dale bagging a brace as he continued his impressive record of netting in every single round of this season’s competition. Determined not to be outdone Conference North outfit Worcester City conjured up a huge giant-killing for themselves after toppling Coventry City 2-1 at the Ricoh Arena. Sean Geddes was the hero as his brace condemned the League One side to “one of the worst defeats in the club’s history”, according to deflated boss Sky Blues boss Steven Pressley. Meanwhile up in the Conference Premier Dover and Chester enjoyed their time in the spotlight after conjuring up victories enjoyed victories over League Two teams Morecambe and Southend respectively. Elsewhere Maidstone United, of the Ryman Premier Division, held Stevenage of League Two to a 0-0 draw, whereas Aldershot came agonisingly close to booting out the 2008 FA Cup winners Portsmouth, League Two, who salvaged a draw thanks to a late Danny Hollands header. 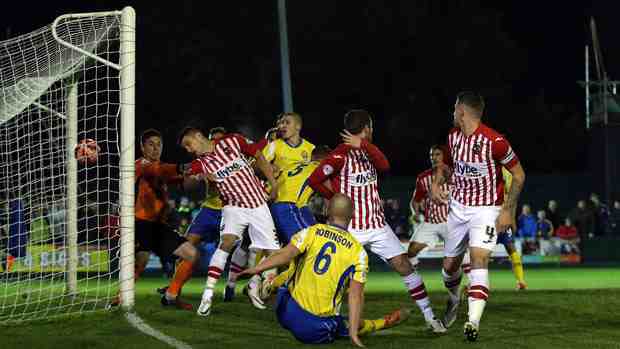 While there were a fair share of scalps, there were also a multitude of “routine wins” for Football League clubs, who managed to avoid an embarrassing early exit. The most relieved of which will be League One’s Bradford City who came from behind against FC Halifax Town goal to win 2-1 in front of the BT Sport cameras. Similarly third-tier outfit Scunthorpe United carved out a victory at Forest Green Rovers, while Chesterfield and Colchester battered Braintree and Gosport Borough respectively. League Two basement club Hartlepool put aside their league troubles by beating East Thurrock 2-0, whereas Bury ended the spirited challenge of Hemel Hempstead after coming from behind to win 3-1. Elsehwere there were victories for the likes of Barnsley, Oldham, Tranmere, Wycombe and Bristol City. Furthermore Conference high-flyers Eastleigh continued their excellence start to the campaign by securing their passage into the Second Round for the first time following a last-gasp win over fellow Conference side Lincoln. The early rounds predominantly tend to feature a lorry load of goals, with this season proving to be no different after 72 successful strikers were scored across the 37 matches. Gosport Borough and Colchester United contributed nine of that tally during an enthralling 3-6 encounter at Privett Park. Like Colchester, Chesterfield also hit the half-a-dozen mark in a 6-0 demolition of Braintree in Essex. Elsewhere League Two’s Cheltenham fired in five goals after they thrashed in-form League One side Swindon 5-0, whereas League One sides Port Vale and MK Dons were involved in a seven-goal thriller, won by the latter. Meanwhile Bromley – no doubt furled by their chairman’s promise of a trip to Las Vegas is they reach the third round – edged out Kent rivals Dartford in another seven-goal thriller at the Fortress Stadium, as they progressed through to the Second Round for the first time in 30 years. Over one-sided matches saw Gateshead trounce Norton United 4-0, and Barnsley hammer managerless Burton 5-0. It is safe to say that Martin Keown was not a popular man following the conclusion of the Second Round Draw. The Arsenal legend plucked out a whole host of difficult draws for the non-league sides, most of whom face an extremely tough task of venturing on further in the competition. For instance Warrington, the lowest ranked side in the draw, were handed a tricky trip to Conference high-flyers Gateshead, while Worcester will have to repeat the feat of the previous round by knocking out another League One side, in Scunthorpe. Elsewhere Blyth Spartans will be looking to capitalise on Hartlepool’s dreadful league form by dumping them out of the cup, whereas Chester travel to Barnsley, Dartford visit Bradford, and Dover jet off to Cheltenham.